Home » BLOGCHAIN » Pura Coin » PURA is now listed on OpenLedger! PURA is now listed on OpenLedger! PURA Vida everyone! We are very proud to announce that as of today you can trade PURA on OpenLedger, a decentralized cryptocurrency exchange (DEX). Great efforts are underway on an ongoing basis to list PURA on the major exchanges. We are happy to reach another milestone! This exchange is an open-sourced marketplace based on the Bitshares platform for cryptocurrencies or blockchain investments. Buyers and sellers interact on a one-on-one basis via peer-peer (P25) trading applications. Bitshares is based on one of the newest and fastest cryptocurrency technologies in the world – the Graphene blockchain. OpenLedger is a blockchain technology company with headquarters in Denmark. It was founded in 2015 with the objective to solve problems such as speed, stability, security, and transparency in the cryptocurrency ecosystem. OpenLedger is primarily a cryptocurrency trading platform that lets traders of all levels access cryptocurrency markets. The trading platform is OpenLedger DEX. However, the platform also includes an advertising technology called HubDSP, tokens called OBITS, and a crowdfunding system called ICOO. All these services are “the ecosystems” of OpenLedger DC. Further details on this ecosystem are coming up in our blog, the BlogChain, this week! 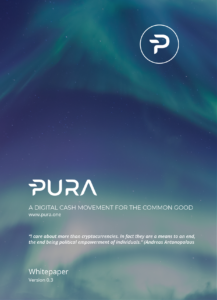 PURA is the world’s first socially and environmentally conscious cryptocurrency that is programmed by protocol design to contribute up to 10% of its mining rewards to the common good. PURA allows you to interact worldwide privately, directly and instantly with fast transaction times. The number of merchants around the world accepting PURA is growing on a daily basis. In order to sustain a high number of coins in circulation, PURA sets proof of ownership for a masternode at 100,000 PURA. For more information, please read our PURA Whitepaper. So – Happy Trading everyone!